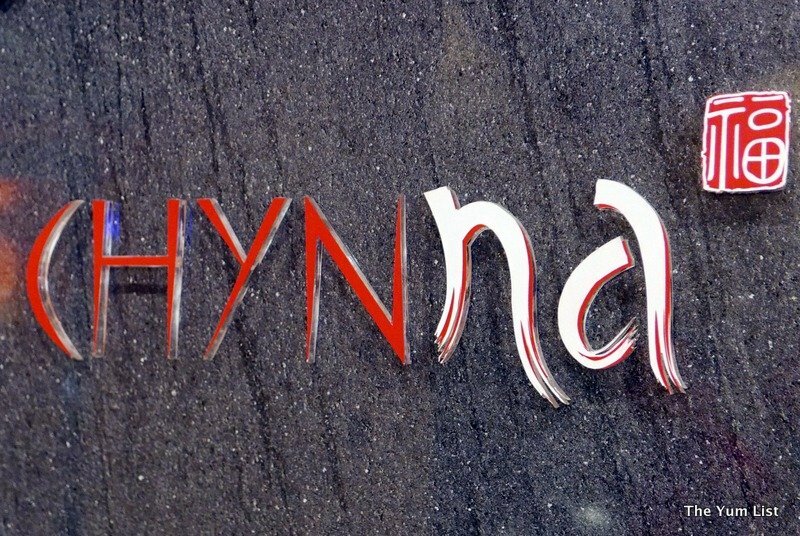 Chynna is another Hilton brand that has done extraordinarily well in a city with fierce competition. 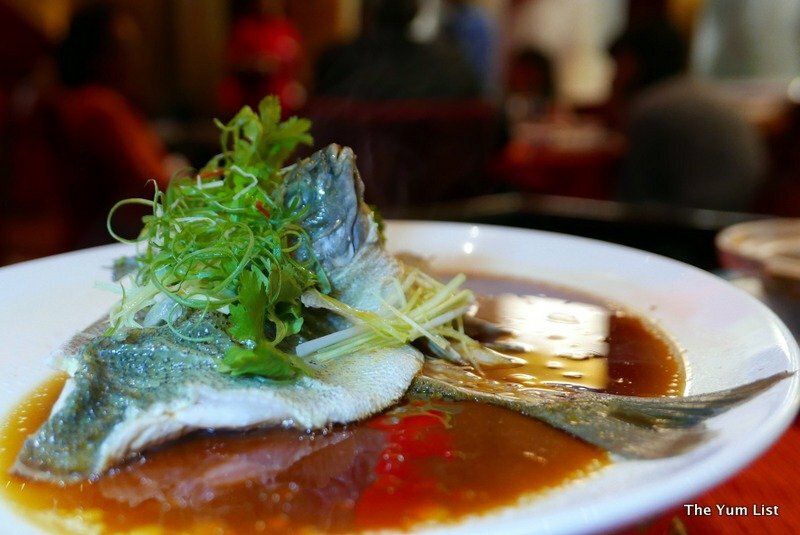 Chinese restaurants, small, large and on palatial scales are on just about every corner, in every venue imaginable. 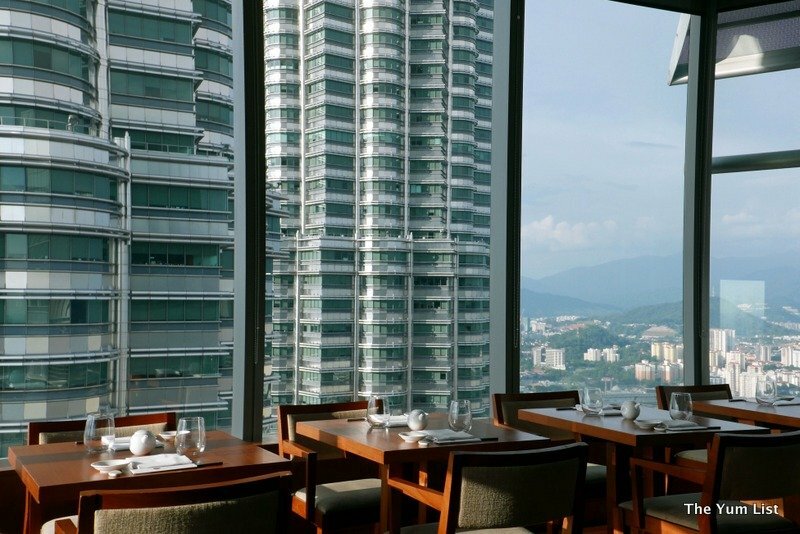 In the elegant dining scene however, few have managed to capture the total experience as has Chynna at Hilton Kuala Lumpur. 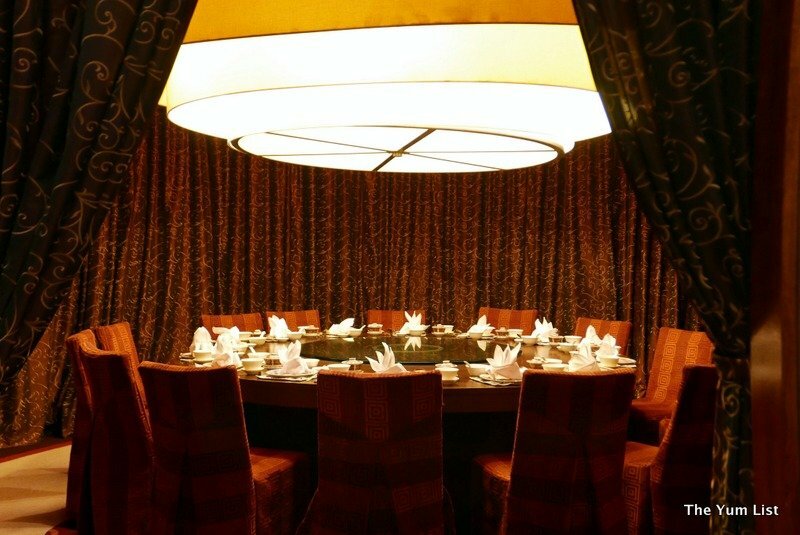 The design of the restaurant is striking with no detail left without attention. Guests are greeted at reception over an antique cabinet, and then led through a double doorway shaded with an ornate eave. 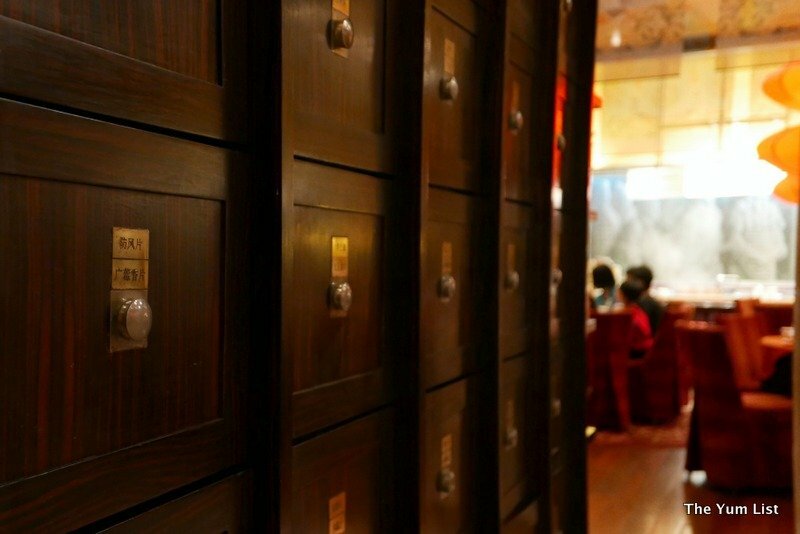 An ancient looking medicine cabinet borders the left, a cube structure built of wooden beams and transparent cloth encloses the middle, and in the distance steam rises from the open dim sum counter. 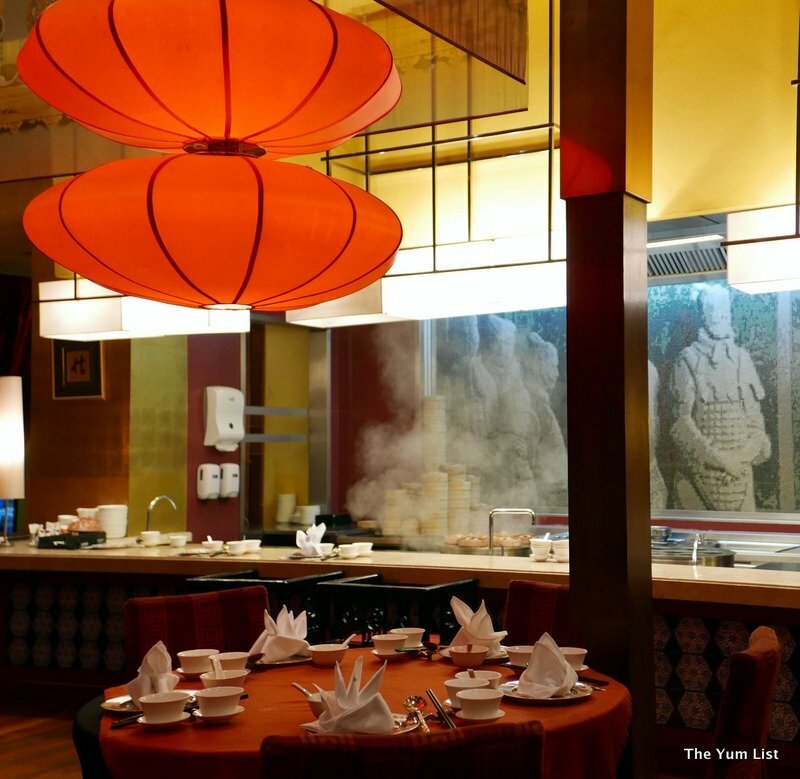 Tasteful red lanterns hang at differing heights glowing with a soft red light. Hand carved rosewood chairs border tables with red textured cloth. Embellished silverware makes each lift of the spoon an eye catching one. Every staff member is in impeccable costume with robes of gold, red and deep blue. 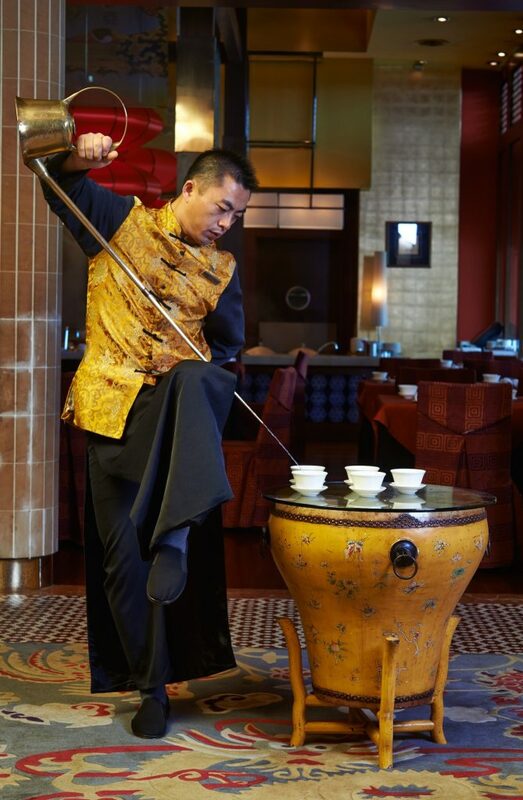 A tea master carries a long spouted Chinese teapot and pours the first cup for all guests in a dramatic show of finesse. 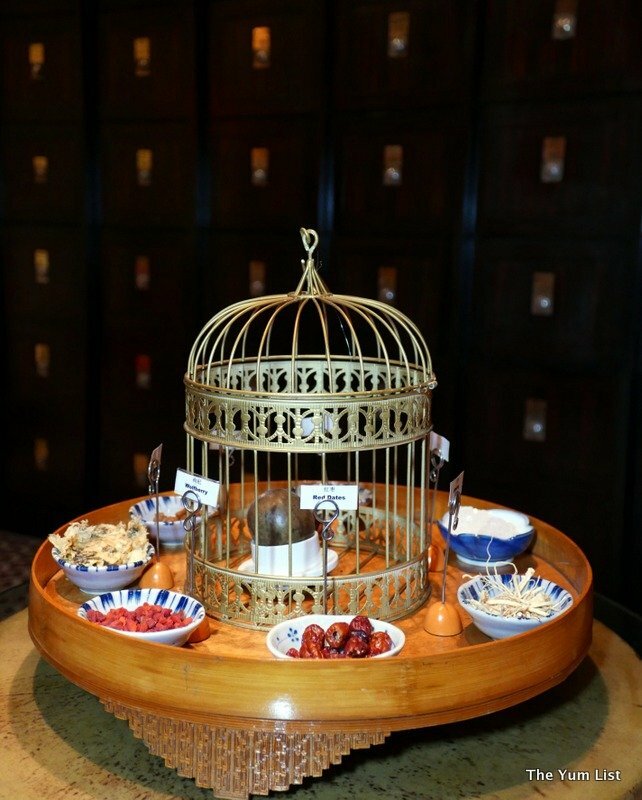 The house pour is his special recipe made with longan, wolfberries, jasmine, chrysanthemum, rock sugar and red dates. As you might imagine with those ingredients, the tea is fruity and mildly sweet. The food menu is extensive and we’re happy to have some very knowledgeable staff make recommendations. 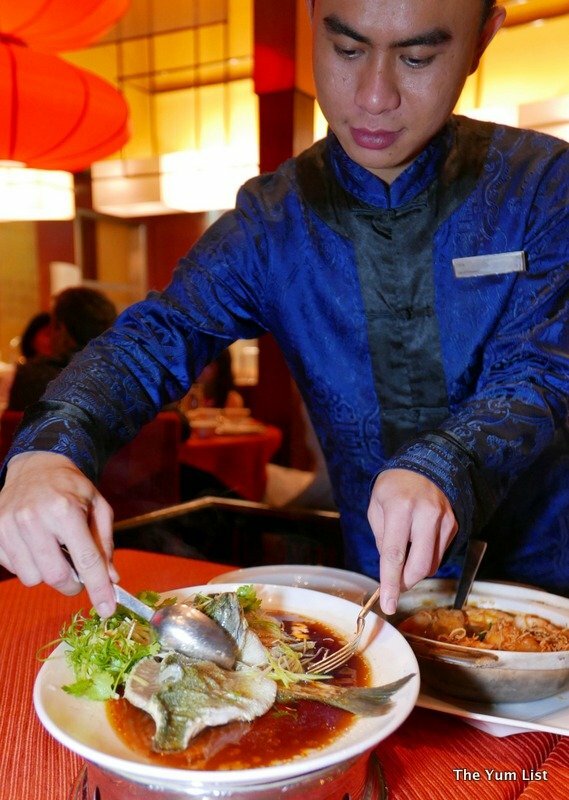 Given our preferences – seafood, light, fresh, no fried items and nothing too spicy – our host rattles off a list of possibilities. Double-boiled Peru maca roots with snow pear and chicken soup (RM68) arrives piping hot. It’s a good job it takes me a few minutes to photograph as it does well with a moment to cool down. It’s absolutely brimming with ingredients. Every spoonful holds a chunk of meat, fruit or vegetable. 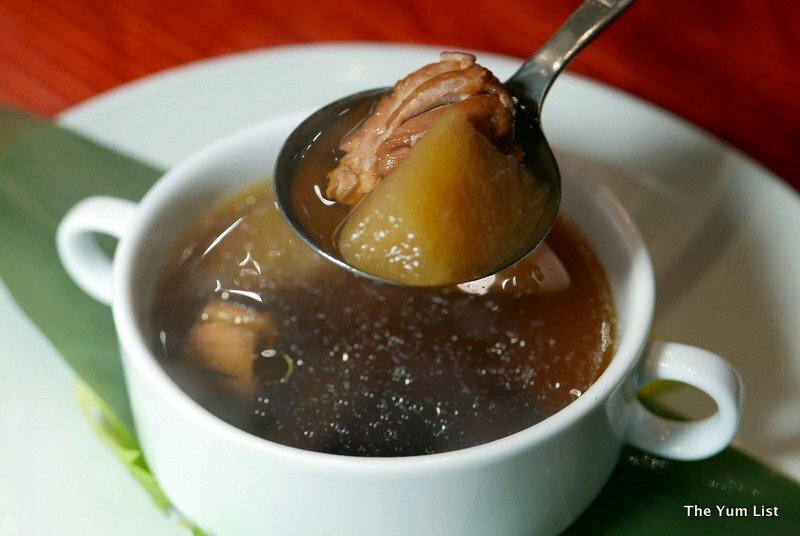 The pear and dates give the soup a lovely sweet edge. Live Jade Perch from Sarawak (RM33/100 gm) is said to be rich in Omega 3 fish oil, and hence good for health. It’s steamed in a light ginger soy sauce and done to perfection. Beware those however who prefer fillet so as to not see the head on their plate. The presentation of this dish makes the head the centrepiece with the butterflied body fanning the sides. It’s so good that even when the fish is gone, I soak my steamed brown rice (love that they have a choice of brown or white) in the sauce in an attempt to not miss a moment. Pan-seared smashed prawns with onion, Thai lemon and torch ginger sauce (RM118) fill every cranny of the mouth with flavour. We love that they’re already peeled and the firm to bite flesh is smothered in sweet, sour and peppery seasoning. Great dish! Braised beancurd with sun-dried octopus, seafood and vegetables (RM118) is much more luxurious than the name might suggest. Large prisms of curd, soft within and browned on the surface are in a thick rich sauce, abundant with the fruits of the sea and vegetables. It’s definitely a sharing portion. 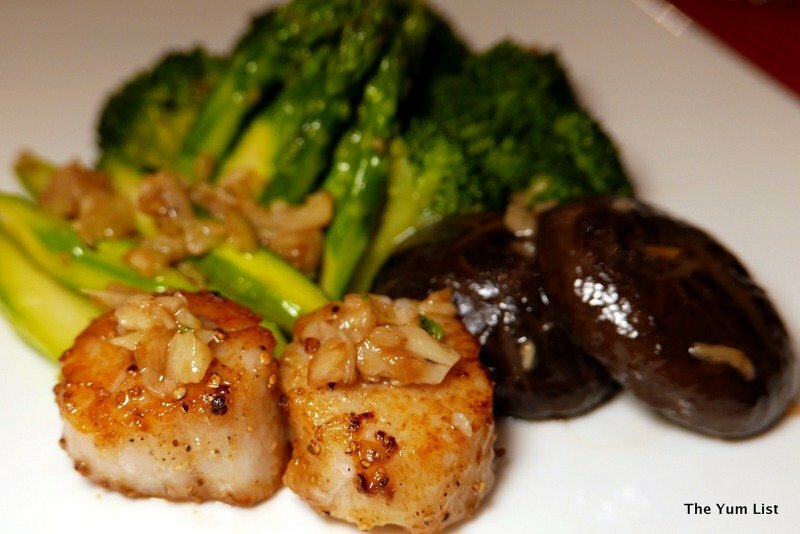 The vegetables of the day, asparagus, broccoli and mushrooms are lushed up with the addition of Hokkaido scallops (RM156). It seems there’s not a single dish on the menu that is done simply. Every recipe appears an extravagance. This is clearly a fine choice of a restaurant for celebrations. Shredded coconut black glutinous rice dumplings with yam paste (RM23) take hubby’s fancy. 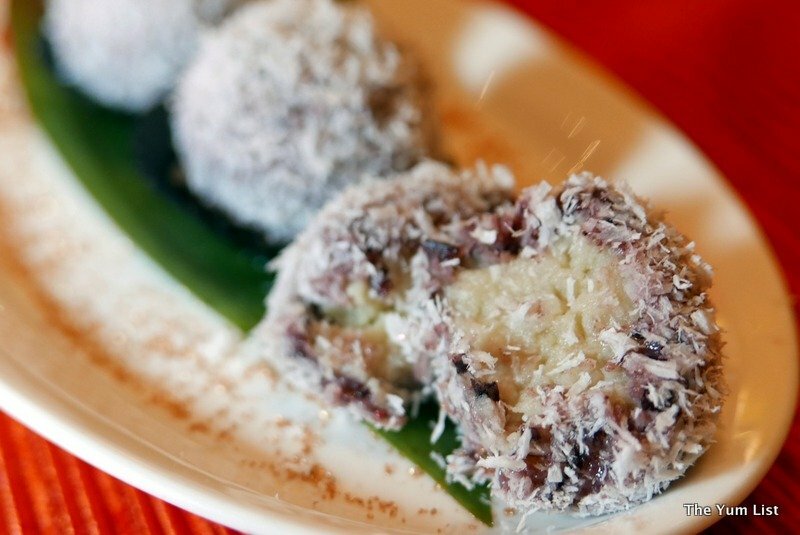 Three substantial spheres resemble mini lamingtons in their coconut casing. Forked open they reveal a soft mashed centre given a purple coat by purple yam. They’re just the right level of sweetness. With the amount of food we’ve eaten tonight one is a fitting amount. It’s another plate that can well be shared. 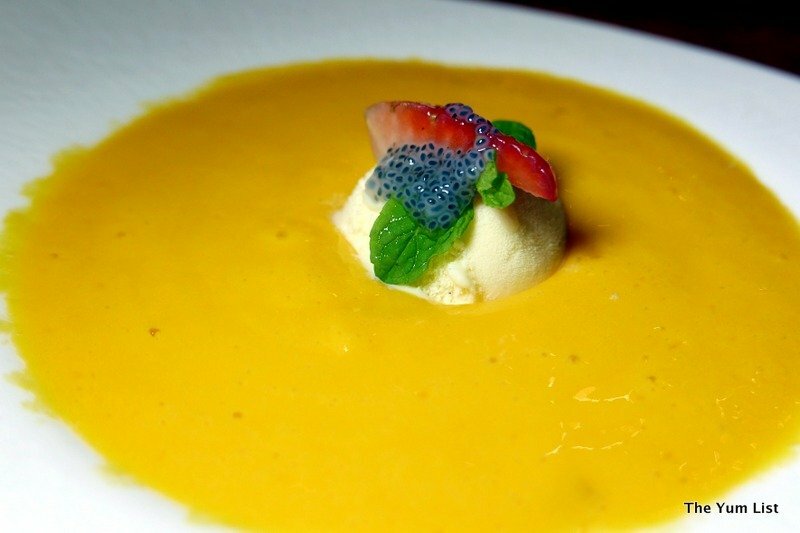 Our favourite dessert however, is blended mango puree topped with vanilla ice cream, freshly peeled pomelo and sago pearls (RM20). 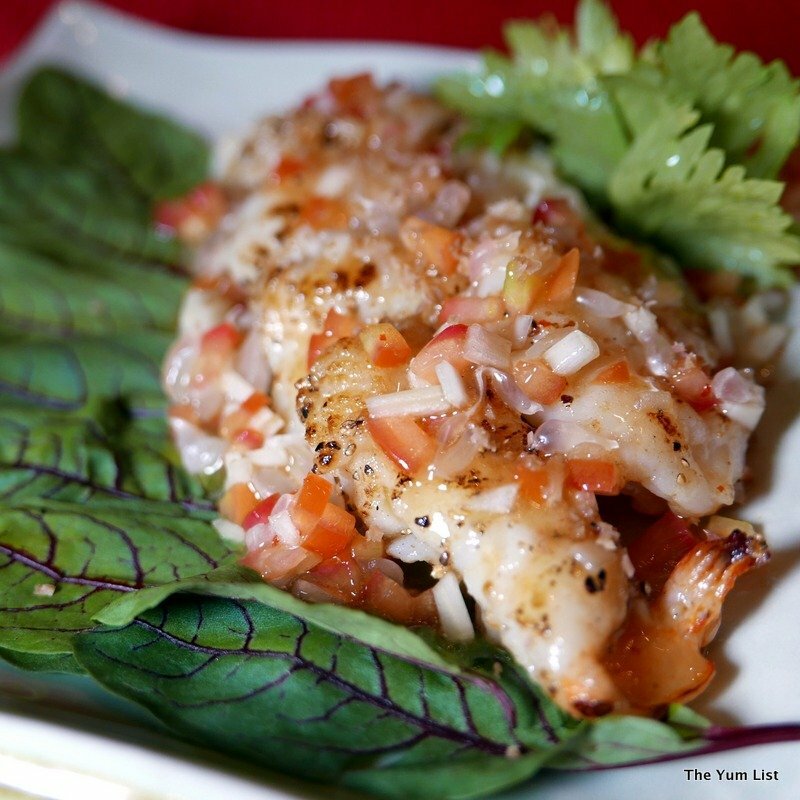 It’s the fresh, fruity tanginess of this dish that we find so appealing. The chilled sweet is light and ends the meal on a high note. 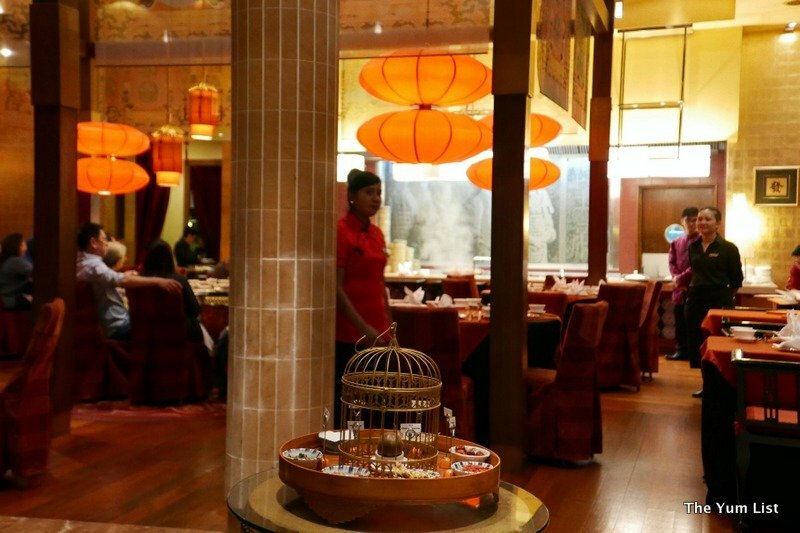 Reasons to visit: fantastic atmosphere; the tea master; our top picks were the live jade perch and the smashed prawns; for a sweet and refreshing ending don’t miss the mango puree. Wow! That tea master is something else! Sure is Ollie! Adds a bit of drama to a meal. Yes, it certainly ticks all of the boxes Magda – great ambience, food and staff. I wouldn’t know where to begin. 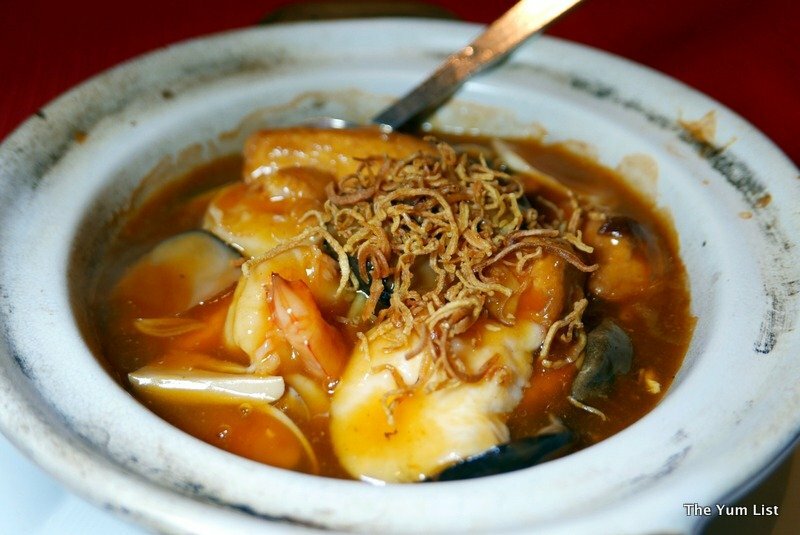 All of the seafood dishes sound enticing. Maybe the smashed prawns would be my top order. Good choice Cynthia. You can’t go wrong with seafood here. I need to hire that kung fu tea master! How do you actually pronounce this place? It does look elegant indeed, oriental elegance. Wasn’t there a female wrestler by this same name? Tea an art within itself. Right! And it’s definitely viewed that way here. I’d like to see that tea master in action. I love seafood too. I will want to see the tea master in action too! I want to try the pan seared smashed prawns and the glutinous rice dumpling. The smashed prawns are calling my name. It does seem a bit expensive. I’ll have to see if my credit card offers a discount. Oh I went here once with some local friends for CNY. Must return. I’d like to see the tea master in action! I want to see that tea master in real life.